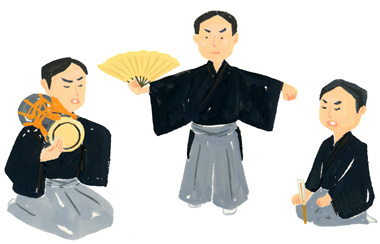 TRIVIA of Noh : Q88 : Are Noh performers all-rounders? | Home | Trivia | Q88 : Are Noh performers all-rounders? Noh music is basically in octuple time, but the time passage is not constant. The rhythm of each scene is influenced by the voices of the musicians calling out, pauses by the reciters, and the speeches and steps of the leading actor. Performers do not follow the same score or the direction of a conductor and there is no stage director who plans the sequence of stage effects, yet they are able to build every scene by blending together the different expressions they produce. In order to make this happen, everyone on stage needs to understand the expressions of the other performers. Actors have to understand the music, and musicians have to understand the drama text and dance. Therefore, performers always have a lot of practice in the other people's parts as well as their own.